Jamie was born at 8.40am - 2.8kgs. Sunny is fine, Kerry is ecstatic and we are very proud grandparents. Yesterday I wrote: There are many ways to go through life but I believe one of the best ways is for one partner to earn money while the other partner manages that money.... And this: If I were a young newly married woman now, I would dive into my new career of being a homemaker. But what happens when you are a single parent or if your circumstances require you both work? I have been on both sides of this. 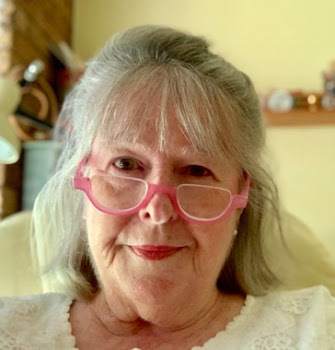 I worked as a nurse and a writer almost all my life, although when my children were young I was in the fortunate position of being able to work from home. I wanted to be there for them, especially when they were younger. They needed guidance and a helping hand, whether they knew that or not. I wanted to shape the people my children became and I was not going to leave it up to their friends or their friends' parents. Hanno and I were the main people in their lives and I believe they benefited from that. I look at them now and feel intense pride for the men they became. I know what it feels like to work outside the home and in it. I have been in the position of having to pick up a pizza on the way home for dinner that night, I've cut corners, left beds unmade, fed my family packet macaroni and cheese and a whole lot of other things that I remember well and I'm not particularly proud of. However, I'm not hard on myself. I accept that I did what I could each day and I know that when I could do better, I did. I feel regret for some decisions I made but I don't feel guilt. I know I'm far from perfect and if I made mistakes in the past, I hope that I can make up for some of it by talking candidly about our lives now and guiding others, relying on my past experience. I know a lot of you think I'm the bee's knees but I'm just an ordinary woman who has learned from my mistakes and now have the opportunity to put things right, and to write about it. Okay, now we know where we stand. I have been on both sides of the working debate and I am not a saint. One thing I can say though is that I have never criticised any women for the life choices they made. I know, without doubt, that now I am living the way I am meant to live and I encourage everyone who can make similar changes to do so. But not everyone can. Most of us just do what we think is right and what we have to do to get by and when we see an opportunity to change, we do. Nothing excuses any woman who stands in judgement on another's choices. If any of your friends criticise you for working in your home, I hope you tell them you enjoy your life, you are doing what is right for you and your family and that you expect support from a friend, not disapproval and criticism. If one for your friends told you she had a new job as a nurse, journalist or sales person, you would not criticise that choice, you would congratulate her. Expect the same for yourself, and if you don't get it, that person is not a true friend. It seems to me that some women have this slinging match over who has the higher ground. Don't go there, you're better than that. Support other women, and expect support back from them. It is not acceptable to criticise anyone for not going out to work, or for going out to work and neglecting their house work. It's stupid and mean. Be the friend you hope to find. Be the woman/man you want your daughter/son to be. I don't understand where the guilt comes from. Some women have to work and feel guilty for not being at home with their children and not keeping their home as they would like it. Other women feel guilty for staying at home and not helping with the family finances. And some women are made to feel guilt when they're criticised for the choice they made - either to work outside the home, or at home. A couple of ladies have asked how to answer the "what do you do? "- type questions. We should all start from a position of grace and respect. When I'm asked, I always presume they want to know the truth, so I tell them about making pure soap or the most delicious bread in the world or that we just dug our latest crop of organic potatoes or that I just put up the summer tomatoes or some peaches - and how doing those things makes me feel. I usually tell them I have a very good recipe for laundry liquid/orange cake/slow cooked italian beef casserole and ask if they would they like me to write it down for them. Even if the "what do you do" question was not asked with the best of intentions, sharing helps break down those barriers and shows an open heart. 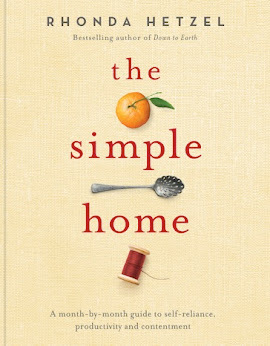 I know there are many readers here who are homemakers, many who work outside the home, and some who combine both. I have respect for everyone who, like me, is doing their best and working towards a better future, no matter where their workplace is. Mutual respect and acceptance will go a long way towards creating caring communities for us all to live in, so when you are asked about what you do, be ready to smile and write out a recipe. Generosity is sometimes contagious. Another email has me writing today about homemaking. It's popular topic here, mainly because it is valued, but also, I believe, because there are too few mentors around who will guide and encourage young people towards a domestic apprenticeship. Those young people, and some who are older, are looking for guidance. The skills of homemaking are seen as menial and not worth much, and often women who work at home, raising children, baking, sewing and cooking are ridiculed as being old fashioned, lazy or "just a housewife". That is a narrow view of what housekeeping is because if you let it, your home will transform you and is capable of giving you the power and confidence to do anything. "Of course, I have plenty of things to do around here and gardening is one of my passions. But I didn't want to be "just a housewife" or "spend my days cleaning". The only role models I have are a couple of other mothers, one of whom employs a cleaner and the other whose chief occupation seems to be acquiring status symbols. Now, of course, I have discovered you! You seem like a heaven-sent mentor and I love your views on being a homemaker and how it is a viable, creative, fulfilling occupation. Young women, I think, find it harder to embrace this role as their peers can sneer. However, I now feel this is a way I can contribute as much as my husband to the home and I'm very excited! Yes, she gets it! Housewifing, homemaking, SAHM, WAHM, or whatever you care to call it can be a rewarding career that will help you to contribute as much to your home as your partner does. Of course, it's not a competition but everyone wants to feel their time is being spent in a worthwhile way and that what they do is indispensable, appreciated, important and meaningful. Women want to make a significant contribution to their families and when they do, they feel valued and confident. There are many ways to go through life but I believe one of the best ways is for one partner to earn money while the other partner manages that money to enable the family to spend less than they earn. No matter what the income is, spending less than you earn is the key. So how do you get to that place of feeling like your work in your home is important and that it makes a difference? You have to take charge of it, you need to identify what it is you need to do, and then carry out those tasks to the best of your ability. When people feel they're in control and are making a contribution, they do their best work. And when you're raising children, it is in everyone's interests - yours, mine, the community's, that you do your best work. Children raised well will make our future brighter. We need to raise givers and doers, not takers and layabouts, our countries depend on it. I guess you could go two ways. You could see housework as dull and dreary, do as little of it as possible, complain that you're bored, watch TV or play on the computer all day, then open a packet of something for dinner and wonder why life has let you down. Or you could do what I would do. 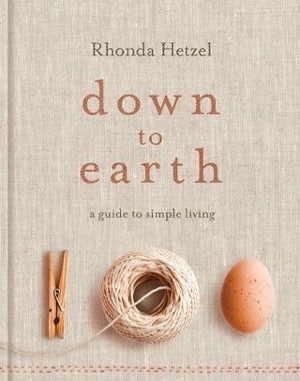 If I were a young newly married woman now, I would dive into my new career of being a homemaker. I would establish a budget and take over every financial transaction relating to the home. I would challenge myself to get the best value for every one of my dollars/pounds spent. I would talk to my partner about future children, a future home and work out, with him, how we would work towards what we both wanted. We would have many deep and meaningful conversations, we would write down our goals, and then we would both work towards them; him by going out and earning a a wage and me by using that money wisely and by creating the best home possible within the boundaries of my budget. I would buy the best quality we could afford, I'd learn how to cook from scratch as well as how to make and preserve jams, sauces, relish and fruit, I'd learn how to make a good loaf of bread and try to keep out as many preservatives and artificial colours and flavours out of our food. I would do that because I would have identified that keeping the family in good health can often come down to the simple things like preparing wholesome, unprocessed food. If you take on any job and believe when you're told that it will be boring, tedious and difficult, you can either believe that, or you can question the motivation behind such statements and find out for yourself. I prefer to believe that anything I spend my time on, particularly when it involves my family, has the potential to be enriching and meaningful. If you're just starting out, or coming to this way of life a bit later, I encourage you to dive right into your job as if it's a struggling small business that will evolve into a great success if you understand what you're doing, put time in to skill yourself and work hard. Once you take that challenge it will give you many wonderful reasons to get up every morning and the more things you want to do, the more you teach yourself, the better you'll feel about homemaking and yourself. You'll realise then that women make most of the buying decisions in the home and that gives you the power of the dollar/pound. Use it. If you don't like the service you receive, if the goods you buy are faulty or inferior, complain. When we're assertive, shopkeepers listen. They're not stocking an ingredient you need? Ask for it. Shopping is best done with a happy mindset, it's not an exercise of walking behind a trolley picking up products and dropping them in. It's much more involved and active than that. Read labels, know what you're buying, ask, know your products and where to get the best deals. Shopping is our battlefield. We want good quality and the best value for our money, the shopkeepers want you to take what is in the shop at the advertised price. 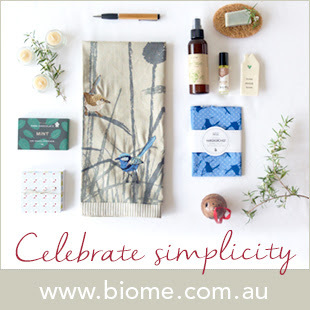 Sometimes getting what you want takes time and it might involve changing the way you shop. And in answer to Kate's question, yes, if I had a large family, I would live like this. I think my children would be happier and I believe it to be the best way to live. Not just as a retired couple, but from the time you walk through the door of your first home as a committed couple. If you're making bread for a large family, you'd make 5 - 10 loaves at a time, then freeze some. On the days you don't bake bread, you might bake biscuits/cookies, muffins, cakes or scones for snacks to supplement the large bowl of fruit on the bench. Soap making takes less than an hour and the soap lasts for a couple of months. Making your own cleaning products doesn't take any time at all, the cleaning takes the same amount of time but with a large family you'll do it more frequently. You'll be doing your laundry in the same way to everyone else, but you'd make your own laundry liquid (it takes less than 30 minutes to make enough for several months), and you'd be hanging the washing on a line instead of using a dryer. It's much cheaper and healthier, to cook from scratch for a large family because there are so many crock pot/roast/casserole/soup recipes out there and you aren't relying on packets of soup or convenience foods to feed them. I'm sure there are many readers with a large family, please chip in here and help Kate understand how a large family works. And don't forget to model the behaviour you want to see in your children. Not just today or tomorrow afternoon, but all the time. As you go about your everyday work, your children are watching and learning how to be when they're older. If you want them to cook and bake, show them that you do it and teach them how to. Let them help you while they're young. Show them how to make their beds, put their toys away, take their dirty clothes to the laundry, feed the dog, put away dishes, sew on a button, how to repair a ripped shirt, mow the lawn, plant seeds, water the garden, clean the car, clean their shoes, watch over their siblings and to be a good citizen. Everyone of those things will enable them grow in confidence, help them as they grow and help you in your daily work. Don't listen to anyone who wants to put you down, no matter what you're doing. If you have friends who demean you, tell them it hurts you and you would like them to respect your lifestyle choice. If they don't, walk away, they're not friends. Believe in yourself, know that homemaking is a valuable way to spend your time, and do your best. What you do in your home will improve your quality of life, even in the most humble home. It's a great investment in your family's future and one you can be proud of. Those "friends" who say housework is dull don't understand its potential. It not a series of mind numbing chores, it's active and enriching work that helps a family be their best. Sure, you'll have days when you wished you could leave it all behind but from my experience, those days are far outnumbered by beautiful days that make you realise there is no better way to live. 10.00 am, Sunny is in very early labour. They were given the opportunity to wait at home so they've gone back home in the hope that Sunny can rest. She's been awake since 3am. They have hourly checks to do and instructions on when to return to the hospital, which is only 10 minutes away. Thank you all for your good wishes for them. I've had a couple of emails lately asking about washing up. I've written about this in the past but its over a year now since we got rid of our dishwasher so I thought it would be interesting to write about going back to washing up by hand. In November 2009, I decided I no longer needed, nor wanted, a dishwasher and asked Hanno to remove it from the kitchen. Today, I wanted to give an evaluation of the water and electricity saved by not having a dishwasher but we've changed both our electric and water companies in the past year and with price fluctuations and different pricing structures, it was too difficult to calculate. Suffice to say we're saving electricity but probably use about the same amount of water. I know there is a common belief now that hand washing uses more water than machine washing. I have seen figures of 63 litres mentioned for washing up by hand. That is a lot of water! My washing up sink holds about 15 litres, my rinsing sink holds about 10 litres. Even if I filled them both to their capacity I'd use 25 litres. As it happens, I use less than 10 litres, twice a day. I explain how below. But water and electricity aren't as much of a concern to me as the chemicals used in dishwashers are. Not only are they very expensive, they're highly toxic and corrosive. Before I gave up my dishwasher, I tried a couple of homemade versions of dishwasher detergent but was never happy with the result. I realised I could not continue using them and still say I cared for the environment. And please, I am not accusing anyone of anything here, I'm just relaying my feelings. The last day I used those chemicals in my home was a happy one. When we sold our machine, we gave the lady all our dishwasher detergent too. I was really glad to see it go. Another cost that's often overlooked in the hand versus machine washing debate is the cost of the machine's manufacture, freight from the place of manufacture to where you buy it, and then to home. Add to that the waste they become when they break down or wear out. All these costs have to be weighed up and considered. If you have a large family, work outside the home and have little home time, you'll probably decide you're willing to pay the various costs. If, like me, you're in a small family with occasional large family groups, you might think the cost is too high and hand wash. Either way though, it's a private decision for all of us. As always I don't expect you to follow what we do here; I expect you to do what suits you and the way you work and be proud of that. For me, there is nothing like hand washing dishes. It is a homemaker's task that hasn't changed in many a long year. What I do is what my grandma did, and her grandma before her. It's so simple and gentle on the dishes, it's relaxing, quiet and satisfying. Just me and a sink of hot water with either liquid soap or dish detergent, a dishcloth, dish mop, stainless steel scourer and brushes, and a sink of warm water for rinsing. I don't dry, I set the plates and cups on the drainer and let them air dry. Hanno wanders along later and puts everything neatly back in its place. There is a line of thought that says the dishwasher washes cleaner, and I believe that is true. Dishwasher water is so hot and the detergent so corrosive, you'd not be able to put your hands into it. I have found that hot water you can put your hands into, cleans effectively, and easily, and we've never had an instance of food poisoning in our home. I've written about over-cleaning before. Cutlery and crockery you use every day needs to be clean, it doesn't need to be sterile. This is how I wash up. After breakfast the plates are scraped, but not rinsed, unless we've had eggs. Eggs stick and will need scrubbing later if you don't pre-rinse it. The plates and cups are stacked in the sink. The morning tea cups and a plate are added and I wash up after we've had lunch - usually another couple of plates and glasses or cups. If I do any cooking or preserving/canning, this is an extra and will be washed up as soon as I'm finished. As I prepare dinner, I wash up as I go, so I add hot water to the sink, wash graters, paring knives, measuring jugs, strainers etc as I use them and leave the water in the sink ready for the dinner plates. After dinner, all I have to do is finish off our two plates, cutlery, water jug and glasses and I'm finished. Everything sits in the drainer to dry. I fill my sink with about seven litres/quarts of hot water, and in a second smaller sink, about two litres to rinse, twice a day. The soap, brushes, scourers, dishcloths, are mostly handmade and used repeatedly, with time out for cleaning or soaking in oxybleach or peroxide. There is one small part of the dishwasher that I do miss - the ability to stack the dishes out of sight until they're washed. But it's not enough of a reason for me to put up with the downsides. In the space the dishwasher once stood, I now have extra storage for recycled jars and bottles and my spare dish drainers. I don't have a door there, it's a red and white check curtain. I'm very happy with this arrangement, it suits my kitchen and the way I work and I'm pleased the dishwasher has gone. It's nothing fancy, but neither am I. All I need is an effective method that suits the way I work, and after shuffling around I finally have it. It was a quiet and run of the mill weekend. We rose each day, showered, had breakfast, made beds and cleaned. Lunch was eaten, dinner cooked, there were several knitting sessions and outside, a garden was weeded and tiny seedlings attended to. We looked like we were going about our business with not a care in the world, but in our minds, we were preparing for excitement and celebration, but also for remaining quiet and continuing to wait. I spoke to Kerry, so did Hanno. We asked about Sunny and was told she was fine and, for the most part, impatient and resting. I searched through my fabrics looking for something soft and warm to be worn by a baby boy but decided against sewing and returned to my "Cute Baby Knits" pattern book. It was familiar to me and I looked into the faces wondering: "do you look like our baby?" No one knows what triggers the birthing process to begin. I like that. I like the unknown aspect, the guessing, the wondering and all the unanswered questions that come with it. I like being tentative and unsure and that in almost everything we do now, we wonder: "should I? what if the baby comes now." In these days of instant everything, I love that we have to wait this long for something so wonderful. In a way it teaches us, all over again, that we have no power over the natural world and that a baby will be born when he is ready, not when we are. On the weekend, Kerry said: "We have everything. We have a bed, pram, bath, clothes, nappies, all we need now is a baby." He is there, waiting for the right moment. Curled up in his watery bubble, listening and getting ready. I can't tell you when he'll be here but I'll say this, the anticipation of waiting is wonderful. Here we all are - waiting on the edge of change. Soon, as well as a baby, a mother and father will be born, and grandparents, uncles, aunties and cousins. We are all ready, "all we need now is a baby". This is a Friday photo feature that anyone with a blog can join. It opens the door to us sharing our lives through these photos and gives us all a new way to discover each other, and maybe form new friendships. Your photo should show something at home that you're thinking about TODAY. If you're in another country you should join in when you read this, even if it's still Thursday. To take part, all you have to do is post a photo, write a short caption explaining it, and link it back to here. Please write a new post, don't link to an older one. When your photo is published, come back and add a comment below, with a link to your blog photo. Please visit all the blogs that appeal to you and leave a comment. If you are wondering why no one has commented on your On my mind post, maybe it's because you haven't commented on anyone else's. Slow down, take the time to cruise around and enjoy your cyber visits. The yarn is plant dyed, organic and fair trade cotton from Peru. It is, without doubt, the softest cotton I've ever used and just perfect for our first grandson, who is due to arrive this weekend. 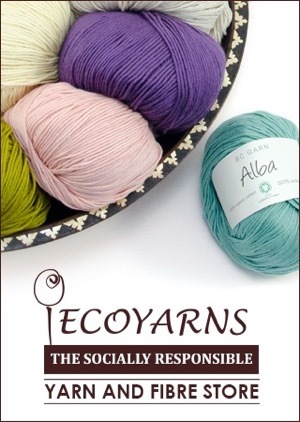 I got it from Eco Yarns and will have more information about it next week. I hope you have a wonderful weekend. Thank you for visiting me this week. Congratulations to Monique on the birth of a beautiful daughter. There is no news yet about Sunny and Kerry's baby but we expect him very soon. I thought he might be born on the 22 March but the actual due date is this Sunday. I'll let you all know when we get the phone call. It's so exciting waiting for a new baby! Hanno bought some of his favourite sugar plums quite cheaply the other day and I thought if we could get some more at that price I'd put up a couple of jars for him. Summer fruits are fading fast now but sometimes you can get a nice bargain with them at this time of year. They're are such a treat later when grey skies and cold winds come calling. If we can find more cheap plums now it will only be a small amount and not worth getting the preserving unit out for such an amount. I'll do them in the oven instead. I have been reading through my book, The Thrifty Kitchen, and in there is a very good guide for oven processing small amounts of fruit - page 153. All I need now are some recycled jars, sugar syrup and a bit of time, oh, and the plums. Wash the fruit well, cut in half and remove the stone. Then place the fruit carefully into a clean jar. Pack it in well, and, with the handle of a wooden spoon, push the fruit into the jar with out damaging it. The fruit will reduce in size as it's being processed. Place the jars on an oven tray without them touching each other. Put the lids on the jars but don't screw them on. 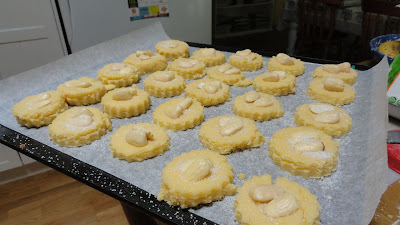 Put the tray of jars on the low shelf in the oven on 120C|250F and leave them for 45 minutes. Ten minutes before the end of the cooking time, make the sugar syrup - 3 cups of water mixed with 2 cups of white sugar and heated until the sugar dissolves completely. Remove the tray of jars from the oven and carefully pour the syrup into the jars, filling them to the top with about 5 mm headspace. Replace the lids and seal the jars. You can turn the jars over to rest on their lids. I do that sometimes, sometimes I don't. Place all the jars on a tea towel to cool and leave overnight. The next day test that the jars are airtight by unscrewing the jar slightly and holding the jar by the lid. If it doesn't pop open and stays closed, it's airtight and can be stored in your cupboard for a few months. If it's not airtight, store it in the fridge. When you open the fruit to eat it, store it in the fridge if you don't finish the whole jar straight away. The Thrifty Kitchen is published by Lantern ISBN 13579108642. We were vegetarian for quite a few years, maybe seven or eight, and went back to meat after reading Nourishing Traditions. When I started buying meat again I was shocked at how expensive it was so I've tended to stay with the cheaper cuts or we eat fish or chicken, along with our favourite vegetarian dishes. Purple sweet potato and onions. I really like meat with the bone still in it. Either as a roast, chops or in a casserole. The meat seems sweeter and more tender, and the bone gives an added depth of taste. One of my favourite pieces of meat is a pork shoulder. When it's cooked well, the meat is tender and delicious, and it's cheaper than a leg or anything from the middle section. We had this shoulder of pork as a hot roast with baked purple sweet potato, onions and green peas on Sunday. On Monday we made sandwiches with the shoulder, last night's dinner finished it off. I stripped the bones of the good meat and the scrap meat - that with too much fat on it - and gave that to the chooks as an added treat. Chickens are carnivores and love meat. The good meat and some of the roasted bones went into a pot for a very nice pork and vegetable casserole. The bones gave a lot of added flavour to the dish. The shoulder fed us well for three days. Stripping the shoulder - one plate with good meat, the other with scrap meat for the chickens. When you buy a shoulder - you can also buy lamb shoulders instead of legs for a delicious roast lamb meal - you can ask the butcher for it to be boned, if that is how you want it. A boned shoulder is easier to cut and you can lay it flat and fill it with stuffing before rolling it back up again and securing it with cooking string. If you do have the butcher bone the shoulder for you, ask him for the bones, because when you roast the meat you can roast the bones at the same time, then make stock with them - and freeze it. But as I said, I like meat with the bone still in so that is how I buy it. There is quite a bit of fat in pork and lamb but if you cook it slowly for a long time, much of the fat will render out, and if you eat it cold the next day, it's very easy to cut the fat out. The dark brown pieces on these bones are where the flavour is. Use that in your casserole for extra flavour and discard the bones before you serve up. You can either buy the expensive cuts like T-bone steak, rump, legs of lamb, pork chops or fillet, or stay with the cheaper things like sausages, neck chops or minced steak|ground beef. But there is a middle ground. In between those two extremes there are the cheaper cuts that tend to take longer to cook, but have excellent flavour and give you delicious nutritious food, for much less money. With rising costs, this is one way to keep meat on the table while staying within your budget. I am absolutely amazed at the support shown in the last post. It proves, yet again, what a close and caring community we have here. I wish I could give you a hug, or shake your hand, but all I can do is say thank you. Yesterday - our bed in the late afternoon sun. I can almost hear the sighs from readers who just want to leave their bed untouched until they get into it again at night, but having a clean wrinkle-free place to sleep is one of the things that will make a difference to your day and how well you get through your work. You are mindful of your diet and exercise, you shower every day - or most days, you clean your teeth, make sure you store your food properly so it remains safe and healthy; your bed, my friends, is in that category. It matters. If you're just going to pull up the sheets during the day, why not give yourself another two minutes and make the bed. You don't need expensive sheets, blankets or doonas/duvets. It doesn't matter if nothing matches, what matters is that your sheets are clean and fresh, are tucked in properly and that nothing in your bed makes you uncomfortable or causes you to wake up. Of course, the best bed is the one you sleep in the first night after your change the bedding. The smell of sunshine on those newly laundered sheets remind me every single time that a simple bed, well made every day, has a power beyond what you think is possible. My sister Tricia made these red worked pouches. They are for holding a nightie or PJs during the day and sit on the bed like little pillows. 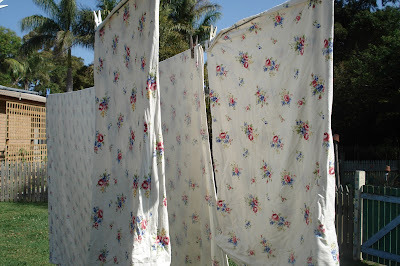 I change our bedding every week, wash the sheets in cold water using home made laundry liquid. Everything is hung in the sun to dry and brought in that evening. Nothing fancy, just very simple. That first night the sheets are pulled tight and tucked in and, depending on the season, covered with a doona/duvet and a quilt, or what we have now that we're moving to Autumn, cool cotton sheets, a blanket and a quilt. Soon we move further towards our winter bed - an electric blanket on Hanno's side, fluffy flannel sheets and a few thick and cosy layers to cover us. Every morning after that first night, I strip the bed down to the bottom sheet, smooth out that sheet with my hands, then make the bed by tightening the bottom sheet, making sure the corners are anchored and the sheet won't slip during the night. The top sheet, pillows and blankets are removed and shaken, then replaced. The same applies to each top layer. During the day the windows are left open to allow fresh air to circulate. The windows are closed when it's very cold, late in the afternoon. Every so often I leave the pillows outside in the sun for the day, and hang the quilts and blankets on the line. It's also a good idea to use a mattress protector and to vacuum the bed every couple of months. Never matching or fancy, but clean and simple. That's all you need. It is easy to believe it's too simple to be an important part of the day but those two or three minutes you spend smoothing, tucking and folding back, care for you during the eight hours you sleep. The time-expended-to-benefits-created ratio is in your favour. If you've never thought about this, or don't think it's worth while, make your bed every morning for a week and I think you'll quickly slip into the made bed camp. Beds are more important than we think. We're usually born in one and we will probably die in one. All that time in between that you spend in bed sets you up for your active life by allowing you to relax into sleep, to dream and to wake refreshed and ready for the busy day. Those three minutes are a sound investment. This is probably not the post you're hoping for today but I need to say something before it makes my head explode. What I choose to write about on my blog is my decision, no one else's. Blogging appeals to me because it's uncensored, independent and raw and I hope that my writing about how Hanno and I live will help and encourage others who want to simplify their own lives. Any of the millions of bloggers throughout the world only have to type their message and click "publish" for it to be available world-wide for everyone to read. In the world of paper publishing there are a number of filters applied to the words you eventually read. In blogging there are no such filters, as I said, it's raw and uncensored, and I love that. I spend about two hours a day writing my blog and reading the comments; the other 22 hours we are doing what I write about, and also what I don't write about. There is no way I would blog about everything we do. I have been very disappointed at the criticism I've received lately about not commenting on the disasters that are happening around the world, namely the earthquakes in New Zealand and Japan. Frankly, I think it's disgraceful that people used these catastrophes in such a shameful way. The first criticism came just after I returned to my blog after taking a couple of weeks off to finish the book. I was criticised for not commenting on the earthquake in Christchurch - even though I was not blogging when it happened! Then, on Friday, this came. Oh. Rhonda I could hardly believe my eyes. I am appalled that you have chosen to post today. Friday March 18th is Bloggers Silence Day in respect of the tragedy in Japan. You chose to write of your money making project. So insensitive. You have just lost a reader. Anna, just because you know about this event, it doesn't mean everyone does. Did you go to every blog that left a comment here to write a similar mean comment to them? I doubt it. Your disbelef was short lived and only directed at me. I chose to write about my book which is what the topic this blog is about. What a surprise. I wonder why you didn't leave your blog address so I could learn from your shining example. Goodbye. I'm sure you're thrilled with the progress of your book but I was disappointed to find you're not taking part in the Bloggers Silence Day. This is to mark our feelings for the people of Japan. Jackie, when you say "this is to mark our feelings for the people of Japan" who do you mean by "our"? Is there a group I'm part of that I don't know about? If there is, I resign. You obviously have a blog and have joined in this day of silence, why didn't you leave your blog address so we could all find out about it? I will not be told how to respond to anything, especially anything as sad and profound as these disasters. I will express my feelings how I think it's appropriate, and in a respectful way that actually makes a difference. You don't know what I did, how I felt about Japan, or what I did about it. One of the things I really hate about the internet is that it gives cowards - they're ALWAYS anonymous - a platform to judge and criticise people they don't know. It's another form of bullying. I don't stand in judgement on anyone. No one. I am not perfect, I make mistakes, I am flawed, just as many people are. What I hope for is that I am not judged at all, but if I am, that you judge me in the context of what I do everyday, and have been doing here for the past four years. Why do you forget the two thousand days I wrote what you liked, and criticise the one day I didn't write what you expected to see? People seem to be quick to judge one mistake on the internet without taking the full measure of someone's history into consideration. One strike and you're out. It's like they're waiting for you to trip up. What causes that? What's happening to kindness, grace and tolerance? Are the qualities of consideration not necessary on the internet? If I leave a comment on anyone's blog, I do it proudly under my name and not as "jackie" or "anna". Frankly Anna-Jackie (I think you're one person), I'd prefer not having readers like you. The people who comment here are part of a community of positive and friendly folk who seek to live well and with an open heart. They don't look for things to criticise. Life is too short. I don't want to be neatly boxed up in a conveniently described package. I don't want to be predictable. I rarely go along with what everyone else is doing. And whenever I am touched deep to the core, my reaction is private and unspoken, not part of a meme on the internet. I'm sorry everyone had to read this but I felt I had to say something - otherwise I'm accepting what they say about me. Tomorrow I'll write about making a cosy winter bed. It will make me feel better. Please support my sponsors: Bean Sprout Bubba and My Poppet, both operated by Australian mums from their homes. Rebecca at Bean Sprout Bubba is very knowledgable about nappies/diapers and I know she will help you if you have any questions or are unsure about what type of nappies to buy. Cintia from My Poppet is also full or wonderful ideas and is a caring mum. If you need help in choosing what you want from her website, just drop a line via email and I know you'll be helped. I want to clarify something after a couple of the comments: the book is completely blank. It's to give me an idea of size, paper and board stocks. One thing that really stood out when I gave up my business to stay in my home was how badly organised my kitchen was, so I set about making it a more efficient and pleasant working area. I thought if I was going to spend a lot of time in the kitchen, baking, cooking, preserving food and providing hospitality, I wanted that space to be comfortable and easy to work in. Soon after, I moved my saucepans out of the deep drawers under the stove and put them in a cupboard near the cutlery drawer. The space they had occupied was packed with plates, bowls and serving dishes that were easy to reach for when the meals were cooked. It made my work easier, immediately. 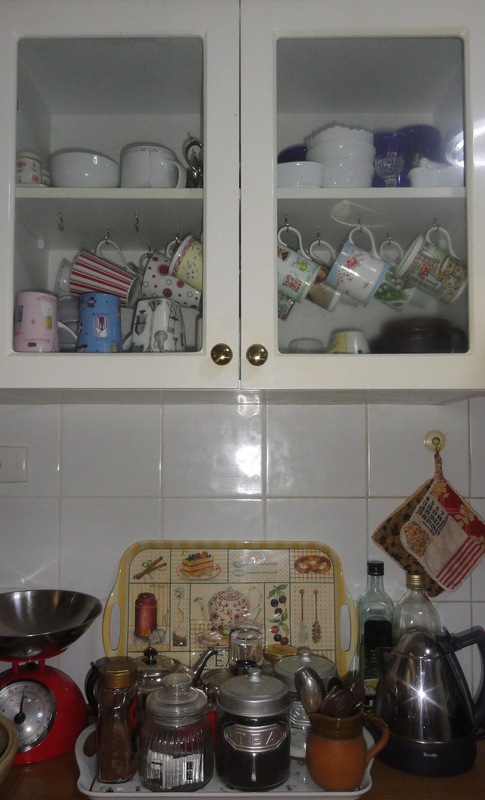 In the top row of cupboards we had glasses, jugs, tea and coffee cups, so under it, on the kitchen bench, I made a tea and coffee making station. Under the cup cupboard, on a tea tray, I placed loose tea, organic tea bags, instant coffee, sugar and honey, and a little pottery jug to hold tea balls, a tea strainer and tea spoons. Next to the tray the electric kettle sits. And it's right next to the sink. We don't have milk in our tea so we can make tea at that little station without moving an inch. It's all within arms reach. 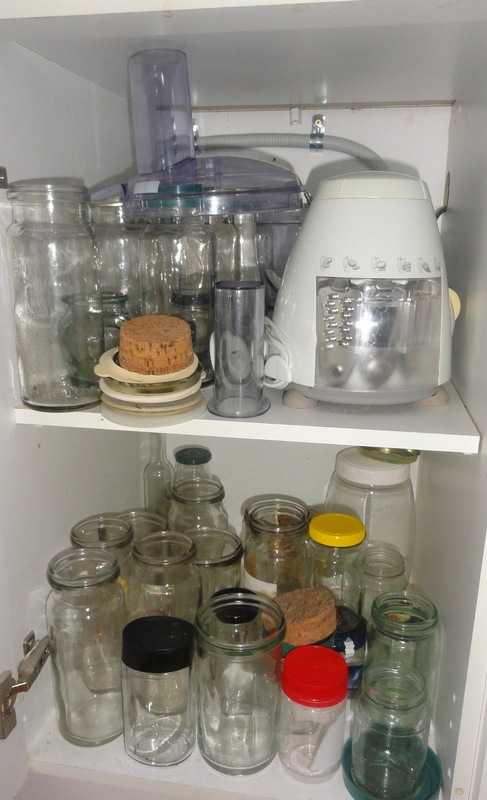 When I started preserving food and making cordial and ginger beer, I needed to recycle bottles and jars. I cleaned out another cupboard and put my recycled supplies and preserving jars in there. A year later I added another cupboard because my collection grew. If you're working in a kitchen that doesn't feel right, I encourage you to change it. Move things around to suit the way you work. 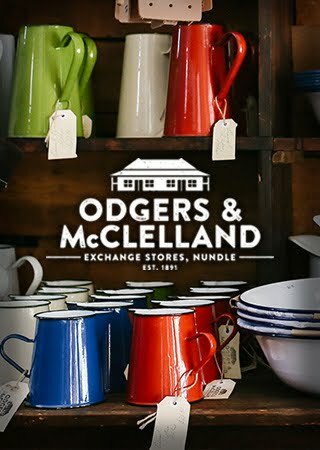 Many of us don't work in a modern way, and most modern kitchens don't have spaces for preserving pans, bottle and jar collections, very large bowls, pots for cheese making or collections of homemade dishcloths, draining cloths and food covers; we have to make spaces that accommodate our equipment and utensils. Think about how you work and the tasks you carry out every day, then make changes that would make your work easier. If you do a lot of baking, see if you can find a way to gather your commonly used baking supplies and bowls in one spot, close to your pantry and where you do your baking. If you want to make compost, make it easier to do by having a covered receptacle that you can fill during the day, is covered to keep flies out and smells in, and that you can take to the compost bin or worm farm once a day. Find a little basket to collect the eggs and vegetables from the garden each day. All these small changes will support the work you do. 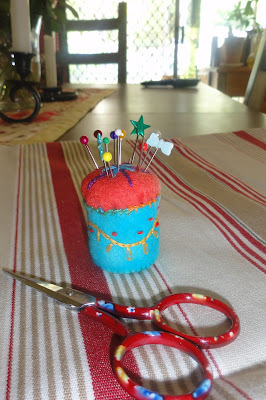 Keep a little basket full of dishcloths so you can grab one when you need it in a hurry, store your plastic and aluminium rolls and baking paper close to where you use them. I have them in a drawer under my main work bench. I've also moved the Coolgardie safe, which holds our bread, next to the toaster. It's much easier. You might have to make adjustments to your kitchen as your children grow. You'll need to keep things away from them when they're toddlers, but make them more accessible as they grow older and you expect them to set the table, empty the dishwasher, dry the dishes or help you serve the evening meal. I think most of us wish we had the opportunity to design our kitchens to reflect the way we work in them. Many of us need a large pantry to accommodate the ingredients for our from scratch cooking and bread making, but what we commonly have is not enough cupboard space. You can't change the cupboards but you can certainly move the contents of them. I encourage you to think about your work and how you do it, then move ingredients and equipment to where you'll most commonly use them, create work stations, gather similar things together and generally organise your spaces to suit yourself. Hopefully the time you put into that will pay off by creating a kitchen you enjoy working in and supports the work you do every day. Yesterday I did what I tell others to do all the time. I took a day off and looked after myself. Around 9am I loaded up my iPod full of music and headed off for the hour's drive into the big smoke. 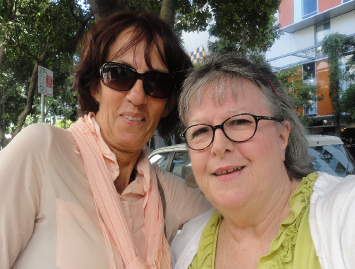 My good friend Susan travelled down to Brisbane from Townsville with her husband and while he was attending to business, Susan and I talked, had lunch, talked, walked around, talked, moved from the lunch cafe to the afternoon tea cafe and talked. It was a lovely day spent with a good friend and it did me a lot of good. I picked Susan up at the Art Gallery and we went to the beautiful West End. Being Tuesday, a few of the cafes were closed but we found a place that sold fresh orange juice and pink grapefruit so we were happy. I have known Susan for over 20 years and we've grown close during that time. She is about 10 years younger than me, her children have just left home to pursue careers and she now has more time to enjoy life. When she emailed last week and said she'd be in town and could I come in for lunch, I hesitated for a while, then realised I wanted and needed to go. I'm so glad I did. It seemed like 15 minutes, but a few hours flew by and it was time to tackle the almost peak hour traffic and drive home. Naturally I got lost. I don't know why they continue to change things as soon as I'm used to them being as they are! I didn't let it spoil my day, I just turned up the music and enjoyed watching people walking along the streets as I found my way home. As soon as I got out of the main traffic I relaxed more, then turning off the freeway onto the Glasshouse Mountains road I felt I was back in familiar territory. I stopped at a roadside stall to buy tomatoes and pears, then five minutes later I was home. As I drove in, Hanno was feeding the animals. It felt good to be back. There were many things I could have done here yesterday but I chose not to do any of them. That trip into town to spend time with Susan did me more good than anything I would have done here. I let Jo, my editor, know I wouldn't be working on the book, she just went on to the next chapter, no problems. Hanno was fine, he worked in the garden and relaxed in the afternoon. The housework I might have done is still there. Sometimes what matters most is the care you give to yourself. There is no fairy godmother who will come along and tell you to take it easy for a while or take the day off. Only you know when you need time out, so be kind to yourself and relax when you need to. No one will benefit if you're stressed or fall in a heap. I think nurturing is a skill we develop as we age and although we may happily take care of our family and friends, we also have to give a little love to ourselves. I'm on top of the world today and ready to face the world - or at least my part of it at my neighbourhood centre. What are yo doing today? Last week, Raspberry wrote: I don't know if you previously did a post about wise economy and what that means, but I would love to see you do one. Wise economy doesn't always means buying what's cheapest, but it can sometimes be difficult to know when it's wise to buy what's cheapest and when it's wise to pay extra, especially when it comes to quality. I would love your thoughts on this issue. Raspberry was commenting on my knitting post when I wrote: I use to think it was a wise economy to buy the cheapest wool; I no longer believe that. The cheapest wool comes with its own invisible price attached. Fibres - even natural fibres like pure cotton and wool, are often processed with harsh chemicals you don't want on your skin. Paying a few dollars more for a better quality yarn will give you a better quality garment and peace of mind, knowing it's not tainted. As Raspberry said, the cheapest isn't always the best value for money. What good is a scarf that you buy the wool for, knit and start to use, only to find that it irritates your skin, is too scratchy or leaves a rash. You won't want to throw it away because you spent all that time and money on it. That scarf will sit in your cupboard and not be used. Saving a few dollars not buying the yarn you really wanted will turn into a total waste of money. There is no rule that covers this. Often when it comes to making a decision on what to buy, you have to try it first. For instance, I thought buying embroidery cotton would be simple and straight forward so I bought a slightly cheaper brand. I discovered when I'd made the cover, embroidered and washed it, one of the red colours ran. Since then I always buy the more expensive cotton. I think the best advertising is word of mouth from someone you trust. If you're going to buy something, ask your friends what they know about it. If you can't find anyone who knows and it's a small item, buy the smallest amount you can to try it. If you're learning how do various things, ask those you're learning from about how they choose their materials or ingredients. If you're starting a new craft, learn as much about the materials as you do about the techniques. Do your research, read good books on your topic and be selective about what you find on the internet. There will be differing opinions on just about everything. buying good quality that lasts, can be recycled, mended, changed, painted, dyed or handled down through the family. This applies to clothes, shoes, appliances, furniture, equipment, tools and cars and much more. The longer you use anything, the more value you're getting for the dollars you put into it. cloth nappies/diapers. I think setting yourself up with cloth nappies/diapers is a good investment. Generally you'll spend about $1200 for everything you need. You have to pay for washing costs, but make your own washing liquid and that cost goes down significantly, hang them on the line to dry, it goes down again. When you have one set, you have enough for most, if not all, of the babies you'll have. The cost of disposable nappies/diapers in Australia, is said to be about $3000 for each baby. It's a big difference in financial cost and in the cost to the environment. buying goods produced in your own country and if you can buy local produce, meat or goods, it's the best bonus. buying organic, if you can afford it. If you can't, buy it whenever you can and be okay with that. Just do your best and rest easy. living within your means, or below it. teaching children the value of money when they're growing up. cooking from scratch and developing a good selection of incredible recipes that people ask you for. When that happens you know the food you cook is healthy and thrifty without sacrificing flavour. never walking down the cleaning aisle of a supermarket unless it is to collect borax, bicarb, vinegar and soap. looking after what you already own. doing your own repairs and maintenance - from darning, sewing and mending to changing the tyres around on your car, changing the oil, checking brake fluid and tyre pressure and everything else you're skilled enough to do. growing your own vegetables and cultivating plants that will allow you to make your own fertilisers - comfrey, yarrow etc. developing a worm farm to help you recycle household waste and to supply fertiliser and microbes to your garden. preserving, canning or freezing excess vegetables. Whether you grow them or buy them in season at the market. paying your mortgage off faster than you're expected to. You can do that by paying fortnightly instead of monthly or paying extra payments throughout the year. It's a sacrifice, but the payoff in savings is extraordinary. getting rid of disposables as much as possible. I guess my overall recommendation is to know about what you buy. Otherwise you're at the mercy of the manufacturers and we all know that's not always the best position to be in. If you go into the shop to buy something, go armed with as much knowledge as possible. When you buy something that exceeds your expectations or disappoints you, tell your friends about it. Making the decision to buy is never easy but if you're aware and have done some research, you'll be better placed. Don't be one of the uneducated sitting on the side lines thinking that everything you should know will be on the label. It won't be. I think there are many good manufacturers and ethical retailers out there. The problem is, generally, we don't know who is who. What are your wise economies? We've started planting! Our vegetable season has begun and will continue right through from now till December, when it will be too hot for us and the vegetables, and there will be too many bugs. We've start off with our cold weather only crops - red cabbage, sugarloaf cabbage, cauliflower and I still have to sow seeds for brussel sprouts. We also have seedlings for marigolds, snow peas, tomatoes and lettuce, and seeds for beans, telephone peas, radishes, Portuguese cabbage, cucumbers, turnips, squash, silverbeet and a few others I've forgotten now. We have to buy kale seedlings and potatoes and we have a sprouting sweet potato that will go in near the chook house. This year, I have something new that I've wanted for a long time. It's a potting box (above). I lose so much potting mix when I plant, so I drew a diagram and asked Hanno to make it for me. Naturally it's made with recycled materials - this is the perfect project for using up what's in the shed - this time he used some old floor boards. Now I can fill the box with potting soil and quickly fill my seedling trays and pots with none falling to the ground. It's much faster because I just scoop the soil in to the waiting trays. I do my seed sowing in a greenhouse Hanno built for me many, many years ago. It a simple construction of a stone floor, shade cloth and benches. In there, I do my sowing, potting on, I keep the worm farm and orchids, as well as any cuttings I have growing. It's the ideal place to keep sick plants, or those that are in need of protection from the sun, heat or wind. The stone floor helps create a cool, moist atmosphere. When I leave any of my plants in there, as long as there is ample rain, they grow like wildfire. I have bins full of potting mix and seed raising mix and it's quite close to a water tank for easy watering. It's the ideal working spot. There is something very satisfying about sowing seeds. It's an exercise in optimism - that these little seeds will break through their case and send up shoots that will survive long enough to fulfil their purpose - the production of vegetables. And planting seedings give you an instant understanding of what the garden will look like soon and how you'll help fill your food requirements over the coming months. 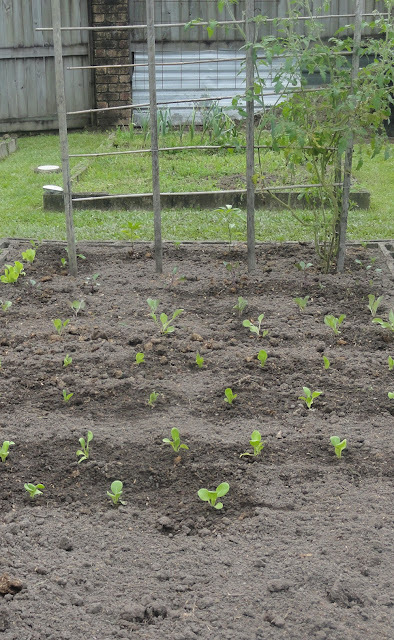 We had the family over for lunch yesterday but before they arrived, Hanno started cleaning up the vegetable gardens and planted the first seedlings. The photo above shows what it looks like today. All that green in the garden beds are weeds that will have to be pulled out. There are a few things left from last year - the herbs (out of view) and a corner full of yarrow, as well as perpetual leeks and some tomatoes. There is also a paw-paw/papaya with ripening fruit, a bay tree and a full Washington navel orange tree in the vegetable garden too. The oranges will be ready for eating around June and it looks like we'll have enough for eating and juicing this year. Freshly squeezed orange juice, particularly from freshly picked organic oranges, is my favourite drink of all time. I am looking forward to that. We hope to pack in enough vegetables to cover all our needs, except for onions, which for some reason won't grow here. The price of vegetables is very high now, so we'll save some money if we can grow instead of buy what we need. To be truthful though, the reason we grow vegetables is to productively use the land we live on, to fill our days with meaningful work, to eat high quality, fresh, organic food, to keep heirloom vegetable seed stocks turning over and healthy, and to eat varieties of vegetables that have long disappeared from the shelves of supermarkets. Supermarkets specialise in vegetables that travel well, that are uniform in size and colour and have been grown quickly, usually with the help of chemical fertilisers. To eat a tomato that tastes like a tomato, to mash the best potato you've ever mashed, to pick a snap pea that snaps, those vegetables, my friends, must be grown in your backyard, picked at exactly the right time and brought inside to be cooked for the table that evening, or preserved or frozen for future meals.